Warminster, PA – May 28, 2008 – OraPharma, Inc., a specialty oral health company dedicated to bringing scientifically and technologically superior products to the dental community, including ARESTIN® (minocycline hydrochloride) Microspheres, 1 mg, recently expanded its commitment to providing educational support and training to dental and hygiene communities by renewing the ARESTIN® Student Access Program and by creating a new Professional Affairs Team to provide field support and instructor training for the program. importance of this program, and reinforced the need for OraPharma to continue it for a second consecutive year. • 73.3% of responding dental hygiene instructors and 56.5% of responding dental hygiene students said they perceive ARESTIN® as being essential to treating periodontal disease. • 86% of responding dental hygiene instructors and 57% of responding dental hygiene students said it was easy or very easy for them to administer ARESTIN®. • 47.1% of responding dental hygiene instructors and 54.8% of responding dental hygiene students said hands-on training with ARESTIN® was the most helpful training element in the curriculum. • 86.3% of responding dental hygiene instructors said they were likely or very likely to participate in the ARESTIN® Student Access Program next year. • ARESTIN® Trial Kits containing ARESTIN® cartridges for clinical use by each participating student. • Instructor Education Kits containing valuable clinical and patient resources regarding periodontal therapy and ARESTIN®, as well as educational content for classroom lectures and demonstration product to ensure each student is able to practice placing ARESTIN® prior to treating patients. • The ability to order discounted ARESTIN® handles ($32.00 each) for all participating senior students. The newly formed Professional Affairs Team will provide enhanced support and introduce additional academic programs to dental and hygiene schools. This team will also provide best practices training and education for course directors in schools participating in the ARESTIN® Student Access Program. Dental and hygiene school faculty who wish to participate in the ARESTIN® Student Access Program, or require more information, are invited to contact the OraPharma Customer Service Center at 1-866-ARESTIN (273-7846). Here is an interesting concept. The Ubanana uCan is an MP3 player that is aimed at the fitness and outdoor crowd. It is waterproof to 5 meters and will even float if it comes off in the water. Designed to be a no muss no fuss kind of system, the user places it around their neck and then inserts the earbuds into the ears. This way there are no cords to be concerned with. It has a 1GB capacity which isn't huge by today's standards, but certainly will hold a decent amount of music. When I first saw this my first thought was - patient entertainment! If it is waterproof, I'd like to see how it stands up to a disinfection protocol. The lack or wires would make it easy to manage in a dental environment and I don't believe the "around the neck" form factor would be a problem. The device is currently available for pre-order for $154 and delivery in July 08. More info and ordering here. The word now is that the iPhone competitor will be available from Sprint on June 20. Not many details are available, but the price is supposed to be less than $300. The device should have something similar to visual voice mail, 2 MP camera, audible caller ID, voice dialing, and lots of other features. Even though I love my Mac, I live in KC which is the home of Sprint, so I plan on getting one. Anyway, I'm looking at this as one more reason you should get one. It's now less expensive and still has free 2 day shipping! Good news for the roughly 34.000 US residents that develop oral cancer in any given calendar year. 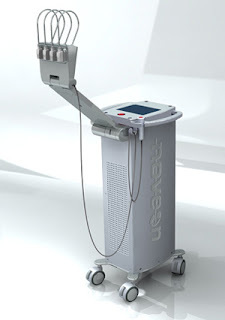 United Healthcare is now covering light contrast exams. The companies providing the products are, in no particular order, Velscope, Addent, Zila, and others. These early detection screenings can help identify oral cancers at early stages that can greatly increase the 5 year survival rate (which hasn't changed much in the last 30 years). This is definitely a step in the right direction. Good news for sure! Studying thousands of patients, Japanese researchers have found a strong link between tooth loss and increased risk of three cancers esophageal, head and neck, and lung. They suggest that preservation of teeth may decrease risk of developing these diseases. In the May issue of Cancer Epidemiology, Biomarkers and Prevention, a journal of the American Association for Cancer Research, scientists from Aichi Cancer Center in Nagoya and Nagoya University Graduate School of Medicine speculate that bacterial infection and inflammation resulting from poor oral care that leads to tooth loss could also be driving development of these cancers. Periodontal disease is known to increase risk for stroke and heart disease. "Tooth loss is a common consequence of chronic bacterial infection and may, therefore, serve as a surrogate for chronic infection and inflammation, which in turn may be important to the pathogenesis of cancer," said the study's lead author, Akio Hiraki, Ph.D., a researcher at the Aichi Cancer Center. Researchers measured rates of 14 different cancers and rates of tooth loss in 5,240 cancer patients in Japan, and compared those rates among 10,480 matched cancer-free participants. The researchers specifically found that people with tooth loss were 136 percent more likely to develop esophageal cancer, had a 68 percent increased risk of developing head and neck cancer and a 54 percent greater chance of developing lung cancer. The researchers also found that the rate of cancer increased proportionally to the number of teeth a patient had lost. These increased risks were seen after researchers took into account a patient's history of smoking and alcohol use. Smaller studies have linked tooth loss to different cancers, but this is the largest study to date, and the first conducted within an Asian population, the researchers say. This is also the first study to show a link to lung cancer, they add. The researchers noted that age and gender affected the associations between tooth loss and cancer risk. For head and neck and esophageal cancers, there were clear associations between tooth loss and cancer risk in women and patients younger than 70 years old, but a less clear link in men and older patients. The researchers say that while widespread inflammation could explain the link between tooth loss and cancer risk, they also note that tooth loss in the cancer patients may simply reflect unhealthy behaviors that contribute to cancer risk. Furthermore, people who have lost teeth may not be able to eat a healthy diet, and diet is also a factor in cancer development. Whatever the mechanism, the researchers stress that oral care is critical to good health. "The oral cavity is a gateway between the external environment and the gastrointestinal tract and acts in both food ingestion and digestion," the researchers wrote. "Oral hygiene potentially affects gastrointestinal flora and nutritional status and may thus have implications for the development of chronic disease." The mission of the American Association for Cancer Research is to prevent and cure cancer. Founded in 1907, AACR is the world's oldest and largest professional organization dedicated to advancing cancer research. The membership includes nearly 27,000 basic, translational and clinical researchers; health care professionals; and cancer survivors and advocates in the United States and more than 70 other countries. AACR marshals the full spectrum of expertise from the cancer community to accelerate progress in the prevention, diagnosis and treatment of cancer through high-quality scientific and educational programs. It funds innovative, meritorious research grants. The AACR Annual Meeting attracts more than 17,000 participants who share the latest discoveries and developments in the field. Special Conferences throughout the year present novel data across a wide variety of topics in cancer research, treatment and patient care. AACR publishes five major peer-reviewed journals: Cancer Research; Clinical Cancer Research; Molecular Cancer Therapeutics; Molecular Cancer Research; and Cancer Epidemiology, Biomarkers & Prevention. Its most recent publication and its sixth major journal, Cancer Prevention Research, is dedicated exclusively to cancer prevention, from preclinical research to clinical trials. The AACR also publishes CR, a magazine for cancer survivors and their families, patient advocates, physicians and scientists. CR provides a forum for sharing essential, evidence-based information and perspectives on progress in cancer research, survivorship and advocacy. Screen - Amazingly clear. Uses electronic paper technology to save battery life and create a very beautiful screen view. The way I understand it, the screen uses power only to create the image of the page and then requires no more power. The only drawback is that screen is not backlit, but then I don't know of a book that is either. Using any kind of light to read is completely adequate. Battery life - Outstanding. This is due to the screen not using much juice since it isn't backlit. The device connects via Sprint's EvDO high speed wireless network and you can extend the battery life even more if you turn that off. Usability - I never thought a device could work like a book. I'm as digital as they come, and I had my doubts. I doubt no more. It feels like a book, it reads like a book, it's portable like a book. Advantages over paper books - In this age of instant electronic gratification, the Kindle really shines. With my busy schedule I don't have a lot of time to head over to the local brick and mortar stores (and there are a couple of them pretty close to my home) to pick up a book. Being able to browse/search the available titles and then have them on the device (via the aforementioned Sprint EvDO network) is a phenomenal time saver. On more than one occasion lately I've had someone suggest a title to me and I've downloaded it on the spot. In a word "amazing". Drawbacks - Truly only one that I can think of and that is price. At $399 the device is a little steep. Of course as it grows in popularity this will come down. Overall, if you are like me and too busy/lazy to hit the stores, but you love to read, the Amazon Kindle is a highly recommended piece of the technology puzzle. With my crazy travel schedule, I'll never be without it. The ability to get a book anywhere I go is just more fuel for my instant gratification furnace. As part of their new marketing campaign, DentalEZ has created a series of videos to promote their products and make you laugh at the same time. The videos can be viewed by going to a special site and can even be downloaded. One of the questions my panel received at DPRWorld was regarding using the Eye-Fi. As we said, it can definitely be used in a dental office environment. I did some checking and found the following post on the web. This is a very good description and pretty much sums this device up. I'm not sure of the author so I apologize for not crediting him/her with this. I am a dermatologist and often take clinical photos of my patients with a digicam to add to their electronic medial records. With the Eye-Fi, a wireless 2GB SD memory card, I can take a photo and by the time I return to my computer the photo is waiting for me. Set up is very easy. You just plug the card in like you would any other memory card, do some basic configuration (the software works with Mac/PC) and you can send photos to the computer via the wi-fi you configure, or send direct to an online site like Flickr. You can also set the card up so several wi-fi are recognized (home or office, for instance), although you must program each individually. If you are using remote wi-fi access (that you have set up), needless to say, you will only be able to put photos online. In the office, we use the Eye-Fi to send to a local computer only. 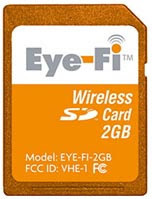 For someone with a built-in or USB SD card reader or Bluetooth, the Eye-Fi may have less benefits. For my purposes, it's spectacular. Previously, all patient photos would be downloaded as a batch and then each would be tediously attached at the end of the day. With the Eye-Fi, the photos are made available right away and they can be attached right when we write each patient's note. The flow is much better. Surprisingly, I haven't noticed any issues with the card draining the battery either. A few caveats: at any one time, one card can communicate with only one computer and one online site. You can, however, set up your account so your card can communicate with multiple computers. In order to switch computers, you go into the Eye-Fi manager on your computer and change the settings (i.e. if you're switching from work and home). While my use and situation may be unique, I also started my somewhat technophobic father-in-law on an Eye-Fi several months ago and it's been working well for him. Previously, he used to just fill up cards and then buy a new one (luckily, with the price of SD cards, that was still cheaper than film, but this is much better!). All he has to do is remember to keep both the camera and computer on, and the Eye-Fi enables him to share his photos online with us with virtually no trouble. At first, he had a few issues and concluded the card was broken. However, I showed him all he needed to do was make sure the computer was on with the Eye-Fi manager running (it can be set up to automatically run when you boot your computer). Undoubtedly, this technology has major potential to revolutionize digital photography as we know it. I look forward to future drivers that could support instant upload via any unlocked wi-fi your camera wanders near. I'm up early again today and getting ready for the final day of DPRWorld. Yesterday continued the panel discussion format iu the morning and then exhibits in the afternoon. The attendees seem to be really enjoying the format which allows them to write down questions and have them delivered to the panel for the Q&A session at the end. I've been amazed at the number and quality of questions that the panels have been receiving. I've also had some nice conversations with attendees in the exhibit hall and around the event in general. Today I am on the moderator's wrap-up panel where we're going to try and answer some of the unanswered questions and give our overall impressions of the event. We just finished the panel discussion. A nice crowd today and we got about 50 more questions than we could answer. We've decided to post answers to the questions we couldn't get to on the web. The first day of DPRWorld is over, but the night has just begun! I'm in my room for a few minutes before I head out to the Zap! laser party and then off to dinner with Daniel Llop. The first day was a lot of fun. For full updates from Advanstar Dental Media, check out this link. Dr. Bob Lowe lecturing on Venus by Heraeus. He's showing minimal prep veneers. The first day of lectures is over. Here is the view from the stage. The Cutting Edge Restorative panel is now presenting. Really great info from these people. Gordon kicking off the show. Part rock show & part dental event, the show has a great look & feel. Today is the day! DPRWorld (which I've been anxiously awaiting) is finally here. I flew in late last night and am ready to go today! The event starts at 8:00 with a brief intro from Allison Walker of Advanstar and will then kick off with a keynote by Dr. Gordon Christensen. My panel does not present until tomorrow so I should have some time today to get some pictures, Tweets (from Twitter), and blog commentary up. Most of these will be done via my Treo, so please be tolerant of my thumb typing. I'm expecting a great time the next few days here in Las Vegas. I'll do my best to keep those of you who can't be here informed. Today is the day I fly to Las Vegas and moderate a panel for the Advanstar event DPRWorld. I'll be posting more frequently if possible so check back on a regular basis. I'm seeing patients part of the day and then I'm Vegas bound! If you are using iPods in your office for patient entertainment or if you happen to have more than one iPod in your home and would like to be able to share the files that are on them, say hello to the miShare. It is a small piece of hardware with an iPod connector on each end that allows one device to send its files to the other. It works with all Mini, Nano, 3G, 4G, Video 5th Generation, and Classic 6th Generation iPod models. The device is available now for $99 and looks at least intriguing at this point especially if you have a really popular mix for the office. miShare web page for more info. I'm now home from the DTS event in West Branch, MI. Paul, Marty, and I had a great time teaching and learning ourselves. We each flew from our respective homes and met up in Detroit on Thursday morning. Marty then worked his magic at the gate for our second leg to Saginaw and arranged to get the DTS posse together in an exit row for the flight. Once in Saginaw we piled into the rented SUV and headed north to West Branch. We spent the afternoon seeing the sights and shopping. We had a great meal at the Willow Tree restaurant and then settled into our hotel rooms to put the finishing touches on the lecture for the next day. Our special thanks to all who attended and spent the day with us. And, for those who care, The DTS trip mascot, Bullwinkle, arrived home unscathed. Here is a pretty incredible story. It seems the hard drive in the picture above is from the space shuttle Columbia. 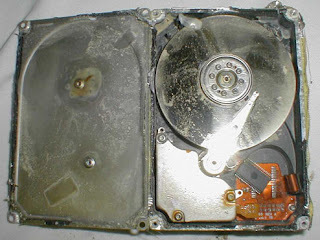 The 400mb hard drive was found in a dry lake bed 6 months after the shuttle disaster. It seems some data recovery experts actually managed to pull 99% of the data off the drive. How amazing is that? For the full story check out all the info at ComputerWorld. The answer, quite frankly, is "I have no idea." With almost all practices being computerized to some degree, any software company worth its salt will offer some type of prescription printing ability. I personally have not hand written a prescription in so long that I cannot remember the last time I did. The advantages to digital/printed prescriptions are many. Record keeping. Every prescription I create is digitally stored in the patient's chart. I never have to worry about remembering to enter the information. Of course all of my other patient notes are digital as well, but Eaglesoft creates an automatic chart note whenever a prescription is created. Efficiency. With all of my prescription templates already created, all I need to do is to select the correct medication and then print it. Today's laser printers are so fast that the prescription is usually printed before someone can even get to the printer. I sign and go. Patient safety. It's a fact that busy practitioners have terrible hand writing. The more times a pharmacist has to struggle to read a prescription, the more the chances for errors increase. Printing prescriptions is one of the best ways to make sure the patient receives the correct medication and the correct dosage. Here is an article that illustrates the point. Although it is written about India, the same situations and problems exist in the US and lots of other areas around the globe. In the continually shifting landscape of downloadable music, you've got to love Nine Inch Nails. Trent Reznor has been a leading proponent of free music and has made music available for download directly from the band's web site in the past. Yesterday he announced that the band's latest endeavor "The Slip" is available for a free download. The album is in a variety of formats and requires only an e-mail address to download. After submitting your e-mail address, you'll receive a link in your inbox that takes you to a download page. The album is available in a variety of formats, but I chose good 'ol mp3. If you'd like to get the album for yourself, click here. For those of you who have been listening to the abridged version of XM satellite radio that has been available for free from AOL, those days are over. Unfortunately the contract between XM and AOL has expired and it doesn't look like it will be renewed. I know lots of you have been listening to XM on AOL's Winamp program and will miss the outstanding XM programming. Of course Winamp has such a great variety of music that a few quick searches will find you really good programming to replace XM, but still it was great while it lasted. Wasn't it? I needed to go to Micro Center today to pick up a video switch box for an upcoming Dental Technology Solutions lecture and I can't just walk into Micro Center and not end up browsing the aisles. I just never now when some nifty gadget will catch my eye. Well today, the gadget that caught my eye was the Icy Box model IB-3220StU-B. Granted it could use a more memorable model name, but the device itself is pretty slick. I have some SATA drives that are looking for a home and the Icy Box has 2 SATA bays. The bay doors are opened by a special key type device and you just slide the drives in and close the doors. No wires or mounting of any kind. It connects via USB 2.0 and comes with one touch backup software for Windows. One of it's better features is JBOD which means that the drives in the box show up as separate drives even though the box attaches to the computer with only one cable. I have it connected to my Mac and all I needed to do was slide in the 2 drives, connect the Icy Box, format the drives, and I have 2 drives waiting to be used. Setup time was literally minutes. It took me longer to plug in and connect via USB then it did to install the drives. If one was so inclined, you could probably remove the drives on a daily basis and use this for a backup device with rotating drives on a daily basis. If you try this, you must power the device down as the drives do not appear to be hot swappable. For a retail price of $69.99 I happy so far with my purchase. If problems arise, rest assured you'll read about it here. Does your gear ever get grimy on your travels? Because of my travel schedule, I often find myself in airports & hotels with all by tech gear. A smeary screen on my Treo, a dirty lens on the digital camera, and a layer of dust on my Mac. This is an easy way to keep all of your digital gadgets clean while on the go. It's great for glasses, screens, lenses, scopes, cameras, PDAs, cell phones, laptops, gaming devices etc., etc., etc. And there's no need for a liquid cleaner and separate applicator cloth - it's all in one! 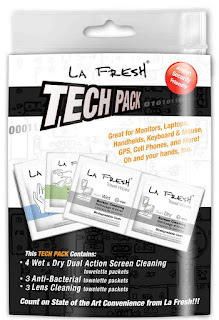 The La Fresh Tech Pack includes four Wet & Dry Dual Action Screen Cleaning towelette packets, three Lens Cleaning towelette packets, and three Anti-Bacterial towelette packets. All towelettes are biodegradable! The entire Tech Pack is travel friendly - it meets the TSA regulations to be carried on board a plane. This pack is perfect for the office, computer bag, car, home, purse, or school locker. The MSRP for the La Fresh Tech Pack is $9.99. 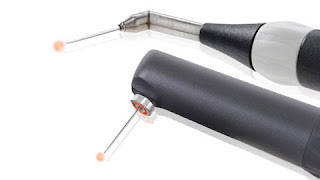 Long story, but a Twitter pal of mine who is an endodontist in Canada announced yesterday (vai Twitter) that someone he knew was doing a live Twitter broadcast of his root canal from the US east coast. I, being the geeky dentist I am, couldn't resist following the updates between patients. Not being one to sit on the sidelines, I sent several "tweets" to the patient wishing him well, asking questions, etc. "I saw the potential for forming an immediate 'smart mob,'" he writes--under the influence of a hefty dose of ibuprofen, I should add. When Jeff heard from a whole bunch of dentists who planned to follow his adventure, he knew he was onto something. "So, while I'm in the middle of the procedure another endontist from Kansas City is quering me on the procedure --asking me what type of numbing stuff I was getting (a combo, my doc said, based on the pH of the various drugs and just where in the jaw and the size it was --more info than I would have ever gotten or have thought to ask). We were having a dialogue in the middle of this!" The endodontist referred to was yours truly. I'd like to take this opportunity to state that I am a general dentist and not an endodontist. However, I do my own endodontic treatments and in my lecturing and consulting career I have stayed in many Holiday Inn Express establishments so perhaps that makes up for it. It's amazing how technology has changed and continues to change our world. As a dentist, you learn to appreciate the value of a smile. As a doctor who loves cosmetic dentistry you get a great appreciation for all the ways you can change a smile to make it look its best. In the late 80's I was part of study at UMKC. I had porcelain veneers placed on my upper front 6 teeth (#6-11). Over the years they had chipped and just didn't look as good as I wanted. I recently had Lumineers placed on my upper teeth and I am loving the new smile, so I decided to change my lower teeth as well by whitening. For the past couple of weeks I've been testing SDI's Polawhite products for Catapult (a consulting group I'm part of) and I decided to use myself as a test subject. I chose to use PolaNight as it's stronger and I wanted a faster result. Consistency - Very good. The material is not too thick, but also not too runny. Too runny can be a bad thing with whitening agents. Sensitivity - For me, not an issue. My teeth are mildly sensitive to everyday things such as cold so I am pleasantly surprised that I have had very little sensitivity and definitely nothing that has kept me from using PolaNight. Packaging - The material comes in a hard plastic container that has 10 syringes, a case for trays, 2 sheets of thermoplastic try material, instructions for usage, and a shade guide for home comparison. Overall, a good experience that I would recommend to others. There are a lot of whitening products on the market and some I've tried in the past and have been unhappy with. Pola is definitely a line of whitening products I would feel comfortable recommending to my patients. Next up is PolaOffice to be used on me. It's the in-office Pola product and we'll see how I do with that one. Access the full page here.